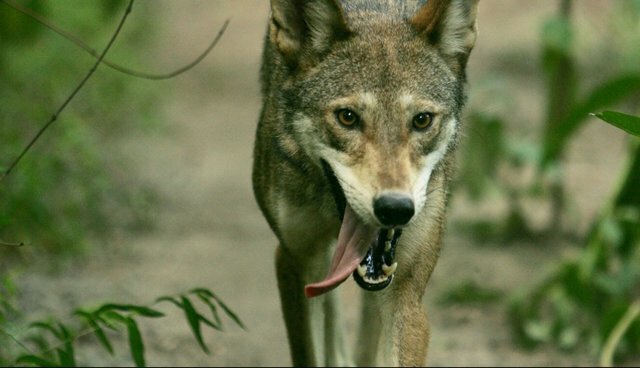 I moved to North Carolina in 2002, with no knowledge of the red wolf. I had never heard of it until I went on a field trip to the Durham Museum of Life and Science with my daughter's second grade class. As I walked around, I discovered the red wolf - a pair in fact - in a breeding program. I went home and researched the wolf and was for once proud of North Carolina. I am usually in shock of this state's wildlife protection or lack thereof. NC is where the only wild population exists. To make a long story short, Americans hunted the reds to the brink of extinction (what's new? ), then someone intervened and said "oh maybe we shouldn't kill all of them." The last 100 reds were rounded up and sent to different zoos and science centers to be left for the next generation to deal with. After some years passed, the reds were released into Alligator River National Wildlife Refuge. So here we are today, the NC Wildlife Resources Commission has asked the US Fish and Wildlife Service to end the Red Wolf Recovery Program and to declare the red wolf extinct in the wild after it captures all red wolves released on private property. Humans created this issue and should be held accountable, it is our responsibility to try and save a species we made extinct in the wild. Wolves are not going to mate with coyotes if they are in a true "pack" in the wild. This only occurs when there are no mates. Wolves will help control coyote populations. Here's a thought: maybe if we didn't kill all the wolves there wouldn't be this coyote "problem" everyone keeps talking about? How about people without science educations quit making laws affecting nature? Do humans ever learn from their mistakes? Every time you take a species out of the food web there is an impact somewhere else! Should we talk about the poor Red Knot here? Here is a link to the news story. Will you be their voice? Email every NC representative and tell them destroying a species is not ok.